For this challenge our prompt was G is for…. 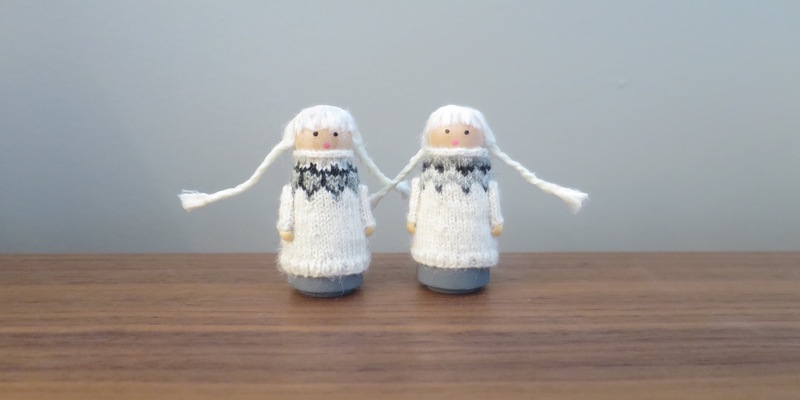 Well, G is for girls, sweater girls! 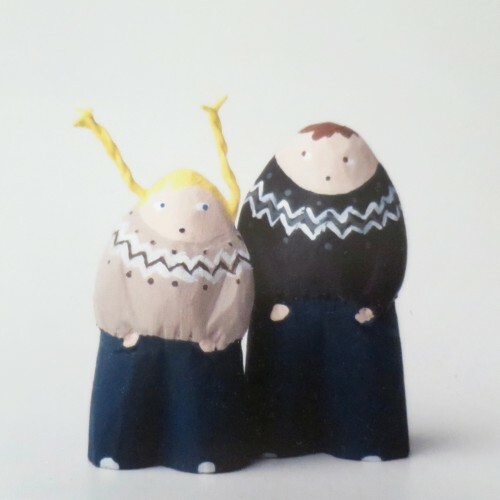 When I was in Iceland in December, my friend Lori found this artist, Heavenly Hosts, who carved these sweet little girls and boys in Lopi sweaters. 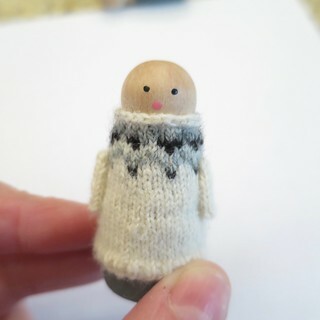 So, here is my version of the little Icelandic sweater girl. 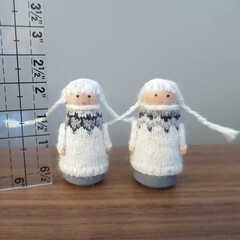 I wrote the pattern for the little sweater for a specific peg (pin) doll. It is Darice 9104-90 2″ Wood Doll Pin. You can get them at most craft stores and the site I linked to sells them for $0.87 for two. 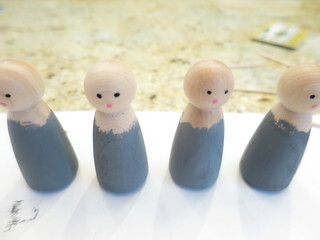 This is a project for someone who likes making little thing. 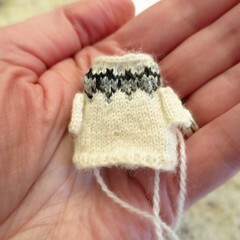 The knitting is very tiny. lace weight yarn in three colors, you just need scraps. 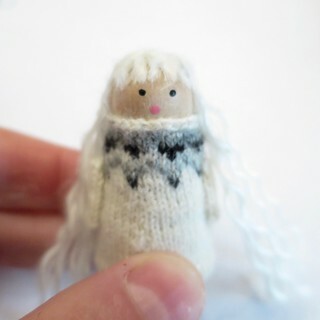 I used Knit Picks Gloss, some random mohair and some crochet thread. hair color yarn or embroidery thread. I used Caron Simply Soft. 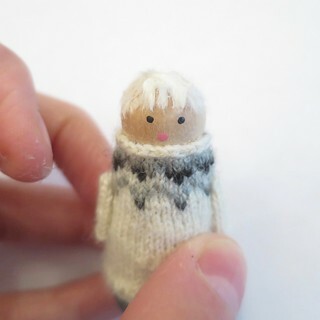 Try the sweater on your doll. 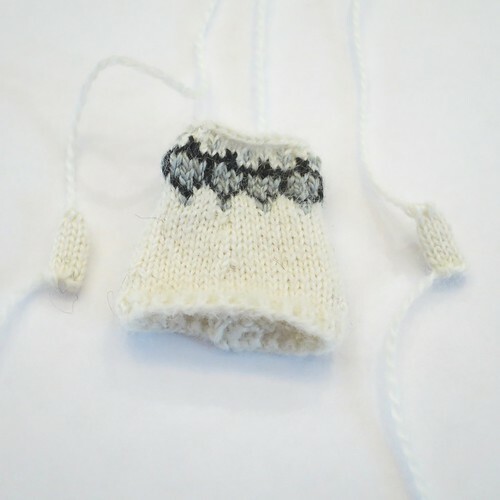 Use the tails on the sleeves to put them in place on either side. Take the sweater off and tie those tails off on the inside. The sleeves will not be very secure, but you just want to hold them in place until you glue them down. Trim the tails except for the bind off tail at the neck. 2. 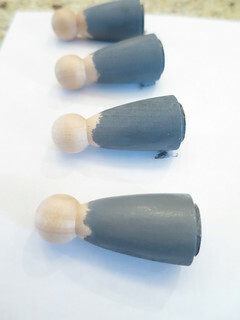 Paint base of the peg doll. Let dry. 3. Paint on the mouth and eyes. I find a toothpick is the easiest way to do this. Let dry completely. 4. Put the sweater back on. Use the bind off tail to tighten the neck is needed and pull the tail inside. 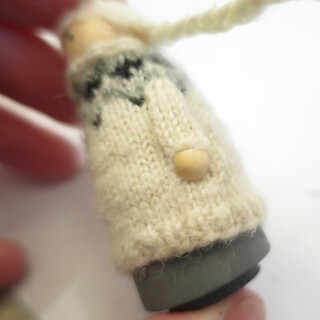 Glue the sweater in place. 5. Add the hair. I used pieces of yarn that I untwisted into strands. Start with small pieces and glue on bangs. I find a toothpick helps move and separate strands. Now cut a bunch of pieces of yarn about 5″ long and untwist them into strands. Glue on to create the long hair. I experimented with different way but the best was to just glue the pieces with the center on the top of the head working my way back until the head was full. Make sure the pieces are close together. Braid the strands on either side of the head. I had 8 strands on each side, so I braided bunches of 3, 3, and 2. Glue the braid together as you go. This will keep it together and make the braid stick out when finished. 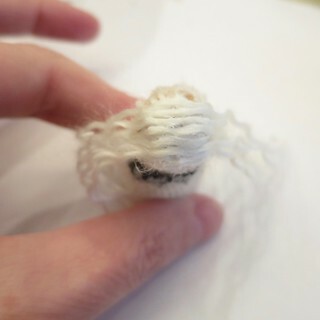 Use another strand of yarn to tie the end of the braid shut. Put a little glue on the knot to hold it. Trim the ends of the braids. 6. 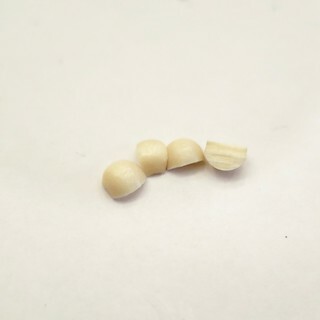 Use the utility knife to cut the wooden bead into quarters. I found it cut really easily and I could actually even do it with scissors. Glue a quarter at the bottom of each sleeve. 7. If you want to make this into an ornament, screw a screw eye into the top of the head. 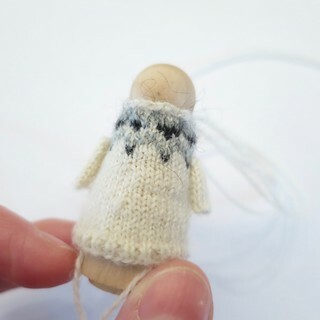 3 years ago by Kat in Challenges , Craft Projects , Crafts , Iron Craft , Knitting , Knitting Projects , Needlecraft , Projects | You can follow any responses to this entry through the RSS feed. You can leave a response, or trackback from your own site. The scale of this project is absolutely amazing. So, so tiny. And to think that this was done from scratch is mind boggling. Truly amazing. And I fool myself into thinking it will be a quick project because of the size, ha! It’s 3:45 am…can’t sleep so I decided to check emails. These are sooo adorable! Thank you for sharing, you’re awesome! Kat, this is a very sweet project and your skills shine through it. Thank you so much, it was a lot of fun. 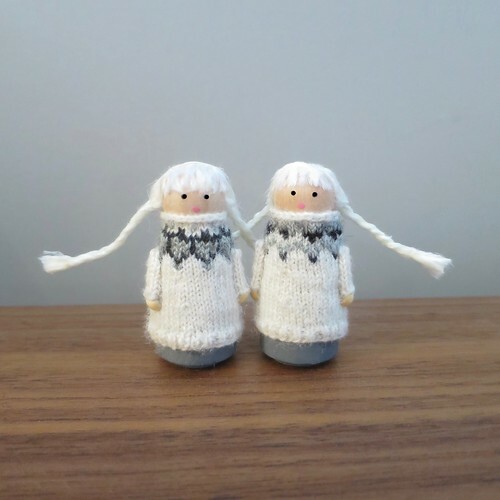 These r so damn adorable….love their braids…cute! !